The Vredeborch Felica is an unexpensive camera designed for the general public. 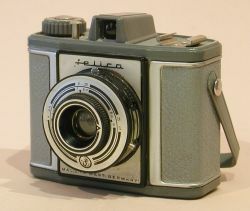 Made in West Germany in 1957 by Vredeborch GMBH, the Felica is a very simple medium format camera with some unexpected features. Made of plastic, it is very light. The shutter gives 1/50 s and 1/25 s plus B pose and flash synchronisation. It is cocked and fired in a single stroke, invariably shaking when shooting. The one element lens has an approximate focal length of 60 mm (equivalent to a 40 mm focal length on a 35 mm camera) and allows rudimentary focusing. The albada finder is square while the camera's format is a rectangle. As with most such cameras, the film follows an incurved course to compensate for the distortion of the lens. A little lever pops up a built-in yellow filter. Another lever allows to choose between two apertures, "sunny" and "cloudy". central, guillotine-type, 1/50 s, 1/25 s and B pose with flash synchronisation.